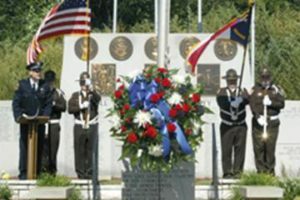 The Gaston County Sheriff’s Office Honor Guard was formed for the purpose of representing the Sheriff’s Office in a formal manner at special events. It has transformed to the now impressive formation that is observed at so many functions and ceremonies throughout Gaston County. The Honor Guard’s mission is to provide a sharp, professional, military style representation of the Gaston County Sheriff’s Office. They perform at memorial services, funerals for fallen officers, parades, and other events that they are called on to appear at by the community. Under the command of and at direction of a team leader, each member takes pride in the wearing of their uniform and adheres to the Sheriff’s Office standard of Appearance, Performance and Demeanor.